A county remains the "shoemaking capital of the world" despite decades of change, industry bosses have said. 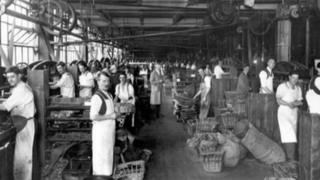 The British Footwear Association (BFA), based in Northamptonshire, has now represented the industry for 120 years. Chairman Robert Perkins said despite Brexit uncertainty and increased global competition, British shoemaking was on the up. "It's a challenging environment but there's a resurgence going on and we're optimistic about the future," he said. The BFA gathered together the county's leading manufacturers for a party to celebrate its 120th anniversary. He added: "We hoped the government would be able to create stability over Brexit but we'll get on with it and make it work. "Cheap shoes were made in the 60s, 70s and 80s, but the industry coped and there's a lot of really nice products in the UK and we're differentiating ourselves." Northamptonshire has a long history for boot and shoemaking, dating back to the middle of the 19th Century when the industry began to grew rapidly. There were plenty of raw materials nearby, including oak bark and water for tanning, and leather from local cattle markets. The county's central location made it ideal for trading. Many manufacturing processes moved abroad from the mid-20th Century due to lower costs. However, remaining firms have seen their fortunes flourish in recent years, selling luxury handmade shoes around the world. The UK makes six million pairs of shoes each year - nearly half of which are exported. Guy West, from Jeffery-West Shoes, said: "For me Northamptonshire remains the shoemaking capital of the world. "We have so many amazing international footwear manufacturers. "There's nowhere else that can claim they produced the boots for Darth Vader, and shoes for James Bond and Prince Charles." The BFA , based in Wellingborough, recently said the industry needed more workers and set up an apprenticeship scheme to try to tempt people to join the profession.